Fish or Kayak out the Back Door! Breathtaking Water Views! Former Model Home. Double Door Entry into Foyer. Formal Dining & Living Room with Wood-like Flooring. Updated Kitchen with Newer Cabinets, Stainless Steel Refrigerator, Glass Top Range, Wine Fridge, Breakfast Bar, Pantry & Breakfast Nook with Waterfront Views. The Gourmet Kitchen Opens to the Expansive Family Room with Beamed Ceilings, Custom Built-ins, & Wood-Burning Fireplace- Great for Entertaining! Master Suite with Walk-in Closet & Slider to Covered Lanai area. Private Master Bath features Updated Cabinetry, Dual Vanities, & Step-in Shower. Private Study/4th Bedroom with Built-ins, French Doors and adjacent Bath. This Two-way Split Floor Plan offers Generous Room Sizes! Two additional Bedrooms share an adjacent Bath. Inside Laundry Room with Utility Sink, Cabinets & Pantry for Storage. Large Sparkling Pool with Pavers & Outdoor Kitchen. Enjoy the Tranquil Lakefront Views, Bring your Canoe and even feed the Friendly Ducks! 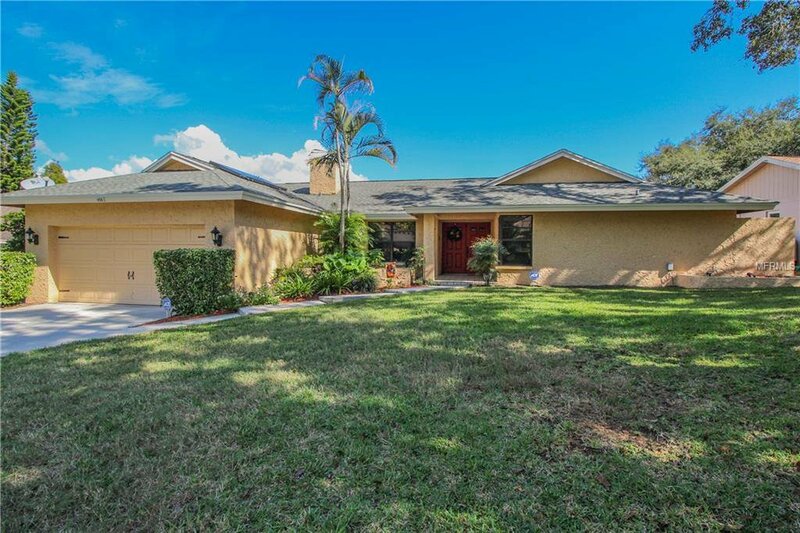 Close to Top Rated Schools, County Parks, Beaches, Restaurants and 30 min to Tampa International Airport. Living Room Speakers DO NOT CONVEY. Listing courtesy of RE/MAX REALTEC GROUP INC. Selling Office: BHHS FLORIDA PROPERTIES GROUP.